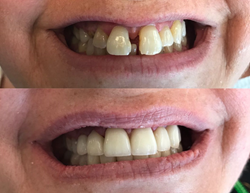 Zirconia Crowns can make a beautiful smile. Dra Gabriela Torres, patient administrator says: “The introduction of our own in-house lab has not only increased the quality of our dental restorations, but also the amount of time needed has been greatly reduced. Many patients can leave the same day, with their new crowns cemented in place. Every year, thousands of American patients save millions of dollars on treatments by visiting dental clinics in Mexico. Once thought of decades ago as a poor quality cheap alternative, one clinic in Tijuana has blown away that false impression with its installation of the world’s most advanced computerized dental equipment and an on-site lab. Minutes from the U.S. border, the clinics of Mexico Dental Network in Tijuana, are able to measure, manufacture and permanently cement a dental prosthesis such as a crown, veneer or crown over implant in just a single one-day visit. Even the majority of U.S. dentists still require 2-3 weeks for the process, plus several visits – and typically charge over 300% more! The process at Mexico Dental Network begins right in the exam chair using an intraoral laser scanner which is not only less uncomfortable and time consuming than doing traditional dental impressions but the margin of error is effectively zero. Crowns are digitally designed in minutes, with a skilled dental technician making minor adjustments as necessary. A CAD/CAM file then controls the center’s in-house milling machine to precisely carve a crown using zirconia or porcelain, which is then heated in a kiln and glazed. The whole process for creating up to eight individual crowns in a single day takes between one and three hours. After manufacture, the crown is ready to be permanently cemented in place. No more waiting weeks with a temporary crown that is likely to break while an off-site lab converts a dental impression into a final crown. Even better, any imperfections or imprecise fitting can be fixed immediately, unlike traditional means which add even more days or weeks to the process. According to the National Association of Dental Laboratories (NADL),only about 3.5% of dentist offices in the U.S. have an in-house lab. This ranks Mexico Dental Network as one of the premier dental providers in both the United States and Mexico combined. Thanks to a lower cost of education, lower operating costs, lower salaries and an overall lower cost of living, dentists in Mexico are able to offer the same quality of U.S. dental services at a much lower price. For example, the average cost for a standard porcelain crown in the U.S. is $1,200 but in Mexico it’s $300. A full set of dentures can cost up to $5,000 in the U.S. but around $1,000 in Mexico. The dramatic price difference makes any added cost for plane fare and lodging still more affordable for people living far from the southern border. With so many procedures at Mexico Dental Network needing only a single one-day visit, the total cost of treatment is even less than other Mexican clinics. For Americans, the U.S.-Mexico border at San Diego is very easy to cross. The clinics of Mexico Dental Network are a few just blocks from point of entry in San Ysidro, CA, and they offer a free car pickup. A passport is required to enter, but a one-week tourist visa is free and easy to receive when crossing. As expected from a busy dental tourism destination, the dentists and staff all speak excellent English. The office uses the same hygienic/sterilization techniques as U.S. dentists and there are regular visits by the Mexico Health Department officials, to insure sanitary standards are upheld.